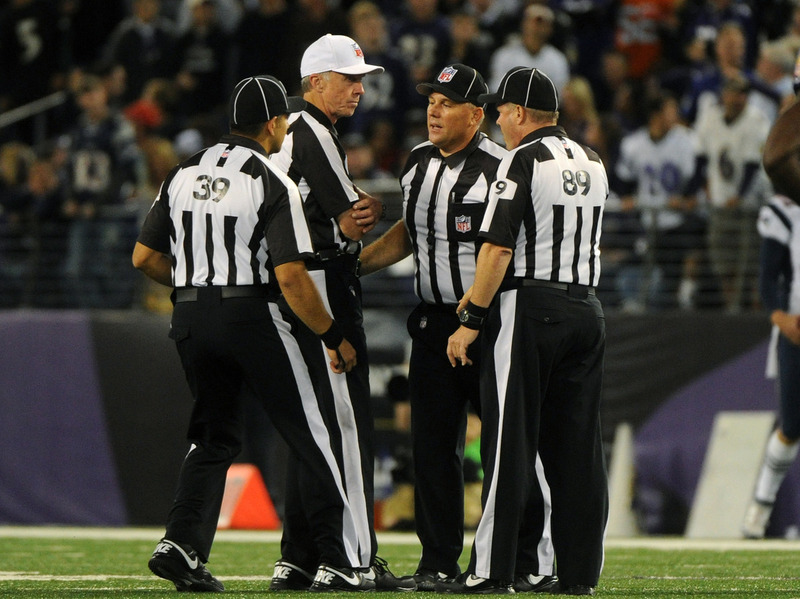 After Uproar, No Clear Signal That NFL Refs Will Be Back Soon : The Two-Way Fans from President Obama and Mitt Romney to Joe and Jane Sixpack are begging for a settlement. But there's nothing to indicate that the NFL and its referees will settle their labor dispute in time for this week's games. Things haven't been going well for these guys: Some of the NFL's replacement referees, during a Sept. 23 game between the New England Patriots and Baltimore Ravens. Though the nation's football fans — from President Obama and Republican presidential nominee Mitt Romney to the average couch quarterback — are begging the two sides to settle their contract dispute so that regular NFL referees can come back to work, there seems to be no clear reason to think that's going to happen in time for this week's games. Pardon the Interruption co-host Tony Kornheiser is convinced that Monday night's debacle (when replacement refs blew the call on the game's last play and Seattle ended up beating Green Bay 14-12) is the tipping point that will bring the league and the officials together before Thursday night's game between the Cleveland Browns and Baltimore Ravens. But Tony's basing his prediction on an assumption that NFL Commissioner Roger Goodell and the league's owners want to head off any further damage to the league's reputation. "Even though NFL commissioner Roger Goodell and his staff spent 16 hours on Saturday and Sunday trying to reach an agreement with the NFL Referees Association, they're still deadlocked on several issues, including pay and the league wanting to take away pension plans for the officials, who earn up to $150,000 a year for part-time work. And even after fan outrage following the Monday night game, which many thought the Packers should have won, the NFL upheld the officials' decision that gave the Seahawks a victory. "And as long as stadiums are filled and television ratings are high, don't expect Goodell and the owners to budge very much." What's more, NPR's Tom Goldman said earlier on Morning Edition, the latest discussions between the two sides were "planned before the firestorm erupted Monday night." There's nothing to indicate that the talks took on added urgency in the past 48 hours, he said. There's also this: All the attention just might mean even higher TV ratings than usual this week, as fans tune in to see if there are any more ref-related mess-ups. Update at 2:15 p.m. ET. Wait A Minute. Could Tony Be Right? ESPN is now saying that "the NFL and the NFL Referees Association made enough progress in negotiations Tuesday night that the possibility of the locked-out officials returning in time to work this week's games has been discussed, according to sources on both sides." It adds that the refs association says "its 121 referees have been trained on the new rules implemented last season, have already passed physicals or are prepared to pass physicals immediately." And The New York Times reports that "the NFL and the referees' union were closing in on an agreement to end the lockout, which has turned the first three weeks of the season into a controversy-filled mess, according to a person briefed on the negotiations."